I am so excited to present this Christmas book to you! I haven't received my copy yet, but the very fact that the first hints of the season are in the air thrill me! Leave a comment about what you read here....there might something in it for you! A wonderful new gift book, A Scrapbook of Christmas Firsts, is available in October for Christmas giving. Today, I’ve invited the six coauthors to share their unique story of how they came together to publish this exciting book full of stories, recipes, tips for simplifying the holidays and so much more (click on bookcover to see the trailer!). First, let me introduce Cathy Messecar, Leslie Wilson, Brenda Nixon, Trish Berg, Terra Hangen and Karen Robbins. Thank you for being here today, ladies. Karen: Thank you for the invitation. You are from three different areas of the country—Texas, California, and Ohio. How did you all meet? Brenda: Actually, We haven’t met. We’re all great colleagues and friends via the internet. Four years ago Terra and I formed a dyad to support each other as Christians who write in the secular markets. 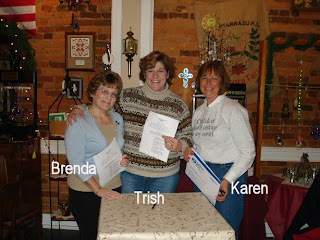 Along came Trish, Cathy, Karen, and Leslie (not necessarily in that order) and we formed a close knit bond of support, creative energy, and professional accountability. Karen: I met Trish through an online forum called The Writers View and she invited me to join the group. Trish: Although we belong to the same Yahoo writing group, we met one by one online. Eventually, the six of us decided that since we all write as Christians for a secular market through magazine articles and newspaper columns, we could support and encourage one another. Leslie: Though we met virtually through The Writers View, I have been blessed to give and get hugs from Trish (at a MOPS conference), Cathy (in the area on business) and Karen (in town for a writers' conference). I can’t wait to meet Terra and Brenda face-to-face, though I feel as though I already know them! How did you come up with the idea to do a book together? Brenda: The book is Cathy’s brainchild. She mentioned the concept of telling stories of events that happened for the first time at Christmas and sharing holiday historical tidbits and recipes and each said, “If you need any help, let me know.” That offer morphed into each of us equally contributing and co-authoring A Scrapbook of Christmas Firsts. Trish: Yep, Cathy came up with the idea and the title, and asked us if we wanted to join her on this project. Of course, we said Yes! Terra: Cathy mentioned the idea for a Christmas book to the group, and someone (I think it was Leslie) suggested that maybe our group could all write the book together. Cathy agreed to lead the way on the project. The earliest email I have on this is from 9/7/05, which shows that this has been a three year collaboration from idea to publication. Karen: (Chuckling) Terra is a librarian and keeps our historical records by saving our e-mails. Leslie: Actually, Terra, I wrote that comment (in a group e-mail) kind of tongue-in-cheek. Cathy, the ultra-sweet person she is, took my joking at face value and here we are. However, I believe God prompted the passion and ideas we all bring to the project and that He will do mighty things as a result of our collaboration! Why did you decide on a Christmas theme? Brenda: It was Cathy’s concept to write a book centering on Christmas. 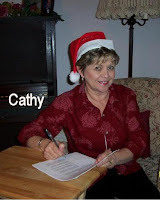 Cathy: For several years, I’d been thinking about Christmas as a threshold to introduce Jesus to folks who aren’t familiar with him, and I love a simpler Christmas with the emphasis on family, friends and doing for others. I knew of some families who had experienced “firsts” at Christmas—reunions, losses, special surprises—and I wanted to collect those stories. Terra: Cathy’s idea immediately resonated with me because Christmas books are “a way past watchful dragons,” as C. S. Lewis wrote. Many people won’t buy a book about being a Christian, but will buy a holiday and family fun book, thus the “past watchful dragons.” People who want to grow in their faith, and people who have no faith but celebrate Christmas will buy our book and hopefully be led to put the focus back on Christ for the holiday, and for their lives. Leslie: Though Cathy birthed the idea, the rest of us quickly hopped on board. Not only is Christmas special to me—especially now that I have a family of my own—but also that particular holiday cries out to be simplified, to return to the meaningful aspects of celebration, and to lose some of the hype and commercialism. 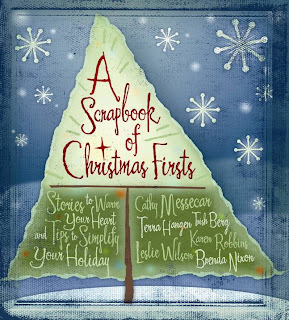 Tell me a little about what is in A Scrapbook of Christmas Firsts? What is your favorite part? Cathy: I like that you can read one chapter in about 15 minutes and, with all the different suggestions, it feels like Christmas Eve. Makes you want to set up the nativity! Many of the suggestions for family activities can be adapted for any family get-together. Karen: There are heartwarming stories about things that happened for the first time at Christmas. For instance, one of my stories is about the first Christmas with our adopted children. And the book is pretty. When I first saw the colorful pages and drawings, I fell in love with the illustrator’s work. Brenda: I don’t have a favorite part – I love it all! Terra: I like the way the parts are woven into a seamless whole, like a patchwork quilt, that is stronger and more beautiful than the parts. Trish: It’s like everything you ever wanted to know about Christmas, all the best tips and recipes, and neat stories all wrapped up in this perfect little package. Leslie: I love reading the special stories, hints, recipes—whatever—and imagining the precious family time that precipitated each moment. Plus, the book is gorgeous, beautifully printed, truly something to be proud of. And we are. I’ve heard that the book is really a nice gift book; can you tell me a little about the format? Cathy: Yes, it’s a hardbound book, full color interior. The layout makes it easy to read. It has a definite scrapbooky look on the interior. 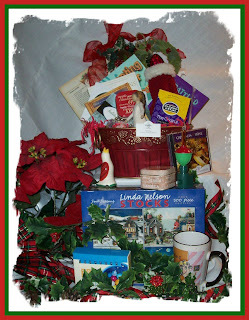 Different logos identify sections, such as an oilcloth-look Christmas stocking appears beside the “Stocking Stuffer Tradition” (help for connecting family members), and the “Cookie Canister” recipes are on a recipe card, and the back ground of “A Gift For You” is a gift box with bow. It’s a classy gift that they can be placed on a coffee table or in a guest bedroom during the holiday season. Brenda: I like to describe it as a Starbuck’s sorta gift book. It’s high quality, crisp, and practical. With six different personalities and areas of ministry, how did you manage to put this all together and still remain friends? Karen: We pray a lot for each other and it helps that none of us have an over-inflated ego. Cathy: There were no squabbles. Surely, we had differing opinions, but we knew that any of us could suggest an idea for this book and that each idea would get fair reviews from others. We actually voted on some aspects—everyone in favor say, “Aye.” If you’ve ever watched women at a Dutch treat luncheon when they divide up a meal ticket, it can be intense as they split the ticket down to the penny. As the project came together, I was in awe of my gracious coauthors, unselfish women who respect each other. For some decisions, we did a round robin—things like book title and chapter titles and what categories to put into the book. Then, as compiler, I’d send out a list of needs to The Word Quilters, that’s what we call ourselves. For instance in a section we call “Peppermints for Little Ones” (hints for children’s activities), I’d put out a call, and the WQs sent in their hints, and then I put them into appropriate chapters. Terra: We are each other’s biggest cheerleaders.We offer support and ideas for our separate writing projects and for personal prayer requests. I love these ladies, and I have only met one of them in person. So far, Karen is the only one who has met each of us, and one day we hope to meet in person, in a circle of friendship and love. Trish: I think we are all very flexible and forgiving. We do have a variety of personalities here, but God has worked amazing things through our little group. Leslie: Though I have seven non-fiction projects in various stages of completion, I could not be more thankful that this is the one to reach publication first. I am truly blessed to have worked with these women, learned from them, watched as they’ve poured heart and soul into crafting a product that will impact lives for the Lord. Where can my readers get a copy of SOCF? Cathy: The coauthors will all have a supply, plus our publisher, Leafwood Publishers, will have plenty of copies an d discounts for buying five or more. Or they can be ordered at most online stores or by your local bookstore. Karen: And anyone who leaves a comment here can be entered in a drawing for a free book and a gift basket worth $200! 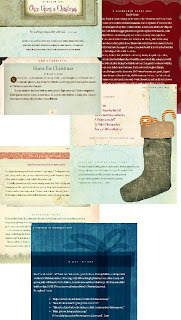 For a list of its contents, check our blog, A Scrapbook of Christmas Firsts. And while you're there, leave another comment and increase your chances of winning! Tell me more about your blog. Karen: We started our blog in July and it is accumulating a wealth of information about Christmas. Each of us posts one day a week following the theme for that week. Watch for new recipes, tips, ways to simplify, stories, etc., similar to what is in our book. Leslie: Ooh, ooh, let me answer this one. I’m probably the newest to blogging among the group, but I LOVE it. I’ve enjoyed posting and receiving comments back from readers. What an amazing adventure having an online voice can be! This blog will focus on a different theme each week—anything from tips to avoid overeating during the holidays to how to give a guest room special touches—and expand on the material in the book. I think readers will get to know the authors’ individual personalities and connect on a more personal level. Plus, they get that many more ideas, information, inspiration (!) at no additional cost. Enjoy a blessed Christmas this year! And thanks for inviting us to share our book, A Scrapbook of Christmas Firsts, with you. I enjoyed reading about your new book and look forward to checking it out in person! I love the Christmas season! This book sounds like a great gift book...for myself and others! I am a huge Christmas nut -- I love the holiday season. I make tons of homemade ornaments, homemade Christmas cards, and homemade cookies. I would love to take a look at this book! This book sounds so interesting. As both a Christian, a person who enjoys scrapbooking, and a person who enjoys everything to do with the Christmas holidays I REALLY want to read this book. I bookmarked your blog and left comments there as well. Would love to enter your draw. And thanks for taking time out of your busy schedules to tell us more about this book. It looks beautiful, and sounds like a real treat. This book looks and sounds wonderful. I love Christmas books and this one looks like it would be a great gift either for me or for someone else. Aw, it's so sweet! Sounds like a great book. Please tell me you're giving this away? 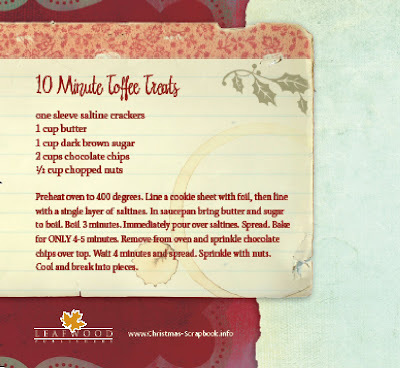 Sounds like it would be a fantastic resource to start some holiday traditions! I LOVE CHRISTMAS it is my favorite holiday. I can hardly wait for it to come every year. Thanks for the heads up on the book too. WOW! Can't wait to get my hands on this one...I love Christmas! That Toffe reciepe sounds delicious! I love Christmas, it's the best time of the year for me, all the get togethers and cooking. I love Christmas books, every year my mom has given me the Christmas Ideals book. I would love to be entered in your contest! Authors alll, congrats on a wonderful concept that looks great! Would be glad to have to inspire all kinds of ideas. This books looks great - I'll be on the lookout for it at my bookstore. I love Christmas! My stepmother would love this - I'll have to keep it in mind as a christmas present - thanks! I too love that hints of Christmas are in the air and this book looks like a wondefully spirited book of the season! I love the way during the season, everybody turns happy and helpful to one another. I'd love a copy of this book to help make Christmas memories for this year and many to follow! I just love Christmas! You can never start too early, I say! Um hello..that last screenshot with the toffee recipe made me very hungry! I love books about Christmas, but I don't think I have seen one yet that focuses on "firsts". I would love ot add it to my Christmas stuff. Sounds like a fantastic book! I love Christmas! This sounds like an absolute delight! What a fun book and the ideas seem fabulous!!! I love the interviews :). Great Interview and I'll be checking this site out this season. Oh, and I'd love to win that basket! I am also trying to making blog related to the chrisms.In this blog i have to say all people that god bless you and fulfill all your dreams.Make life better in new year.